People frequently ask me this time of year where they should go birding. If you live near a hawk watch site like Hawk Ridge in Duluth, Minn., and the winds are blowing from the north or northwest, go there. If you have only a little time and you want a little of everything, find water. As birds travel on their marathon migration between breeding grounds and wintering grounds, they have to stop and refuel. Places with water are a priority — whether it’s a river, pond, lake or wetlands. Even a backyard with a water feature, especially one with a bubbler or fountain, will get used since the sound of running water attracts birds. They know they’ll find food in the form of aquatic invertebrates, and water helps keep feathers in good condition for flying. My patch has a wetland loaded with birds during migration. 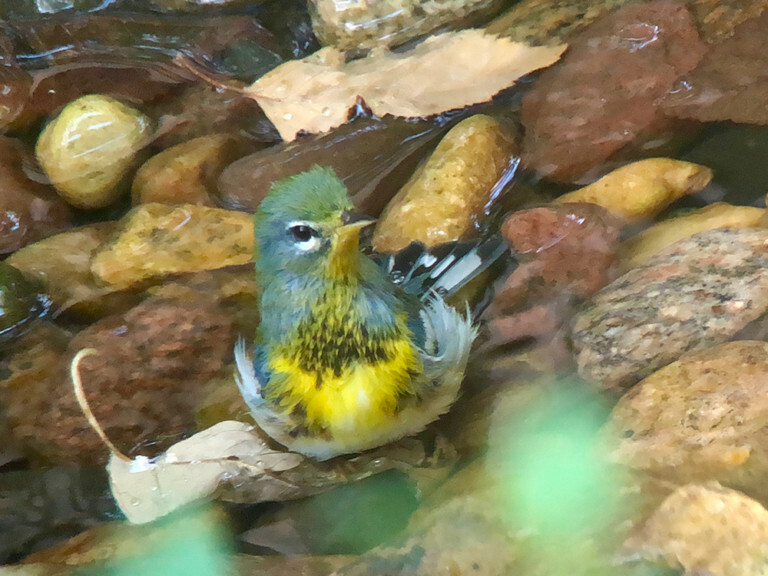 Just this morning I saw dozens of waterthrushes, yellowthroats, white-throated sparrows, Lincoln’s sparrows, and even a Connecticut warbler. They like to forage in the vegetation and glean bugs from the mud. The vegetation also makes a great place to hide when hungry peregrines or merlins arrive. Another spot near where I live is called Westwood Hills Nature Center. Not only does it have a marsh and lake, but there’s a pond with a waterfall near the nature center. While birding there a few days ago, I noticed a flock of robins dropping in to bathe, and soon other species noticed the robins and followed suit. I picked up a veery and even a northern parula. The secret to this pond’s success is the waterfall makes enough noise to draw the attention of birds, and there are lots rocks that make areas of water shallow enough for small birds like warblers to perch for a drink or even bathe. Many birdbaths are too deep for most bird species. Small birds like warblers, sparrows, and finches only need about a quarter-of-an-inch for bathing. If you have a deep birdbath, look for large rocks where smaller birds can perch. Lakes and rivers improve in fall for birding as waterfowl migration gets serious. You’ll soon find wigeon, grebes, ringnecks, and maybe a few ruddy ducks on your local lakes. Every now and then you get a sea duck like a surf scoter or even a harlequin duck. I like to bike around the lakes near my home and scan the water with my binoculars. So you still have plenty of time to enjoy fall migration between now and November. Search water and see what you can find.